Historian Robert V. Remini wrote that the Compromise of 1850 saved America from war for more than 10 years. However, it and the Fugitive Slave Law, which offered bounties for catching escaped slaves, had consequences that guaranteed war would come. Chattanooga is along one of the most popular routes of escaping slaves. Its citizens followed those events closely in their newspapers. One of the first victims of the slave law became a national celebrity who lived in the Nashville area during and after the Civil War. Thomas Sims, born in Georgia around 1828, was the son of James Sims and Minda Campbell and was the much younger brother of the famous Rev. James W. Sims. The entire family had been purchased by James Potter, owner of the Coleraine rice plantation, near Savannah. Thomas Sims, who lived with his mother and sister in Savannah, became an all but independent bricklayer in paying his master $10 per month. Georgia laws severely penalized non-slave African-Americans. Sims avoided those laws by working as a slave. Years later, Thomas Sims had only kind words for his former owner. Potter set prices for freeing the rest of the family but would not emancipate such a valuable asset. Consequently Thomas Sims tried to (unsuccessfully) steal his bill of sale from Potter. On Feb. 22, 1851, Sims used the crowds and confusion of a parade to hide aboard the steamer M and J.C. Gilmore, bound for Boston. Discovered, he failed to convince the captain that he was from Florida and free. The captain, who saw an opportunity to collect a reward and a bounty from the Fugitive Slave Act, had him beaten and locked up. Escaping from the ship, Sims made it to Boston where he telegraphed his wife in Savannah for money. Potter obtained a copy of the message and would have left his slave in Boston, but public outcry for enforcement of the Fugitive Slave Law compelled Potter to reclaim the slave. Sims was arrested on March 7. 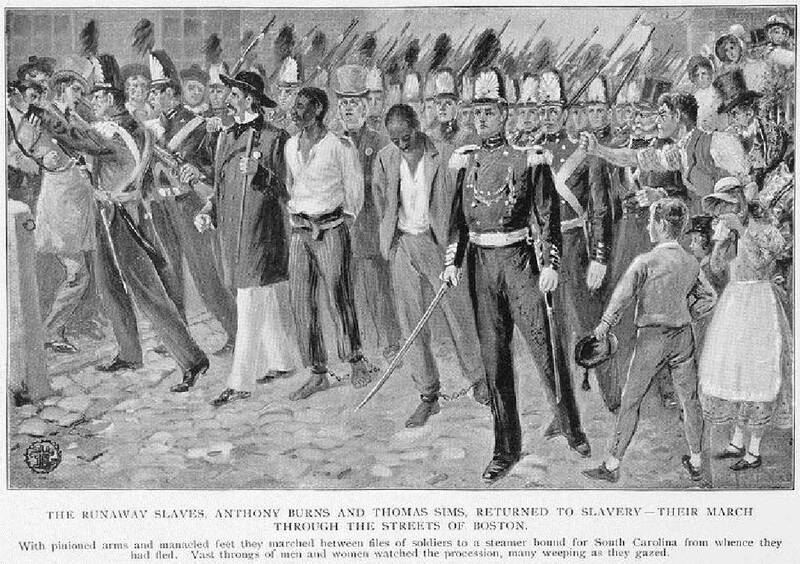 A battery of high-level legal talent fought for Sims' release, while abolitionists plotted his escape. A hearing was held in the Federal Commissioners Court. Hundreds of Boston police and U.S. Marines were used to prevent either his rescue or his assassination by white workers. Prominent voices spoke for and against him. Ralph Waldo Emerson stood up on Sims' behalf while Daniel Webster called for his prosecution. Henry David Thoreau argued that justice for the defendant slave was as chained by the law as was the courthouse locked down. The case set legal precedents, but U.S. Commissioner George Ticknor Curtis ordered Sims returned to Savannah. Funeral bells tolled in protest. His case had become a national cause. Back in Savannah, the slave was prosecuted by local authorities, who held him in jail for two months and whipped him to near-death. A Mississippi brick mason bought him and then allowed him to return to Savannah to visit his family. The newspapers found Sims in 1863 as an impressed laborer on Confederate fortifications at Vicksburg, Miss. With his new wife, child and three other men, he made a daring escape by canoe. Once safely behind federal lines, Sims provided detailed military information on the South's garrison at Vicksburg. An interview with U.S. Army Gen. Ulysses S. Grant earned him and his family passage back to Boston. Sims arrived there in April 1863 and gave a public lecture sponsored by abolitionist leader William Lloyd Garrison. Afterwards he returned south to use his celebrity status to recruit former slaves in Huntsville, Ala., and Nashville for the Union army. A decade later, he settled in Nashville. The media next found Sims moving to Washington, D.C. Charles Devens, the federal marshal, had the thankless task of arresting him in 1851. The marshal tried to buy the slave's emancipation, but by then Sims was a free man behind federal lines. In 1877, U.S. Attorney General Devens made Sims a messenger in the Justice Department in Washington. Sims' story appears in scholarly works including Jacqueline Jones' award winning "Saving Savannah: the City and the Civil War" and Matthew Pearl's best-selling novel, "The Dante Club." Thomas M. Sims died on Nov. 29, 1902, in Washington, D.C.
Robert S. Davis is professor of history at Wallace State College in Hanceville, Ala. A noted author seen on television, he contributes to the Chattanooga Regional Historical Journal. For more, visit Chattahistorialassoc.org.